I awoke to a murder of crows cackling in the trees just outside Calvin’s window. I couldn’t help but think that they were laughing at our pathetic situation. I laid next to my boy in his safety bed, trying to remain still as possible so as not to wake him. He’d had a rough and restless night after another long seizure which had happened far too soon and just after we’d put him to bed for the night. As I laid there, breathing shallowly while listening for another seizure, it occurred to me that he’ll be turning ten on Friday, and I began thinking back to the time when I was his age. I thought first about my friend Monica who gave up dolls so that she could climb trees and squash slugs with me. Then I thought of Jim, the cute skinny boy who played the drums and lived in the next neighborhood over. I had a crush on him for years. He's got triplets now. Then, the faces of countless friends streamed into my thoughts: Katie, whom I’ve known and loved since I was zero; Lidia, my sister-mermaid, who, unbeknownst to me, grew up in a house full of fear and abuse. If that weren't enough to endure, she later suffered her stillborn daughter. It was her writing that saved her. Then I thought of the boy who put his hand through the plate glass window above our heads on Katie’s birthday, and I wondered how I managed to come away without a scratch. I remembered Martin, the tall handsome Swede who died in a plane crash with his father the day before his twenty-third birthday, and of his best friend Andy who, at almost fifty, is now likely grasping the heartache and joy of being a new father. I thought of the B-Kellys, especially Betsy, who became my college roommate and a friend for life; thought of Rick and Kyle and Jenny and so many others who’ve graced my dreams for years, all of whom I could call up now if I had to, knowing they'd be there for me. Calvin has no friends, not really. He doesn’t have play dates or sleepovers or parties. He doesn’t ride bikes, skip stones or climb trees. He doesn’t spy on girls or chalk up sidewalks or win blue ribbons in swimming. He won’t look back fondly on the adventures of youth, won’t have memories of his best friends, his favorite pair of sneakers, his first kiss. Finally Calvin stirred, and with that the day began. A day like any other, really. He whined most of the morning, put his hand in the yogurt, poked his eye, bit the bookcase, tripped over the chair, tried to eat his slipper, dropped his sippy-cup, stared at the sun, flailed on the changing table, shrieked in the car, fell backwards in the cafe, drooled up a storm and scratched my face, though not on purpose. “Calvin has ruined my life,” I grumbled to Michael as we headed down a street caked in sand and salt. “He’s ruined mine too,” he replied quite matter-of-factly. He went on to say that, if not for Calvin, we might be in Hawaii now. Or Italy, or California, I thought, at some residency or villa, Michael working on his Guggenheim Fellowship project while I'd be writing in cafes and strolling along beaches with nothing but my thoughts. “But maybe, without Calvin, I wouldn’t have found my writing,” I finally added after milling these thoughts over for hours, "and look at all of the wonderful people we’ve met because of him." Michael nodded. I pondered what it might be like not having had kids, considered the immense freedoms I’d have. Then I realized—felt—the growth Calvin has afforded me, the amazing chance to see the world from a completely different perspective, to care for a life more than my own, to sacrifice—yes—but also to reap the rewards of the unconditional love of a child. My child. "But are you happy?" I asked Michael, to which he responded with something like, "Sure. Of course," and I believed him. I guess I’m a better person for having had Calvin, I decided in silence, despite the circus that my life has become. And I heard the murder of crows squawk again, this time as if in accord. 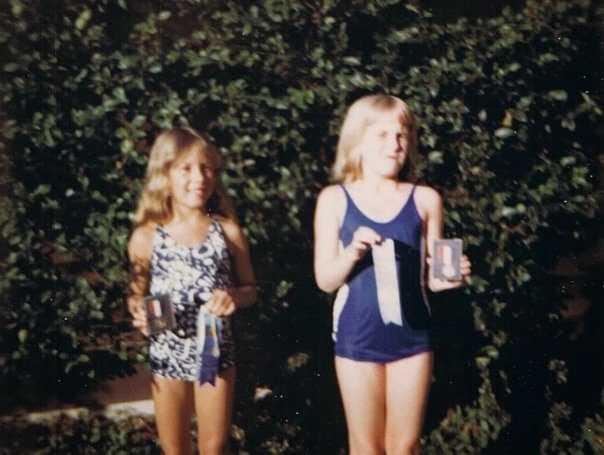 Me and my friend Pam when we were nine or so. My life with epileptic child is a constant stand by with a scary feeling in my guts. Bad dream that doesn't finish. Sometimes I wonder am I really on candid camera or an object of some experiment?! This expression is so deep, so mature, so thoughtful that it makes me realize how amazing human beings can be. Your writing, while it breaks the listening heart, is a model for a "put-together piece" which writers can aspire to in order to really communicate, and I applaud you for helping us understand. Christy, I do not know what my life would be if I had children - maybe better, maybe worse. But I do know that my life is better with your writing. So for that, I thank Calvin.